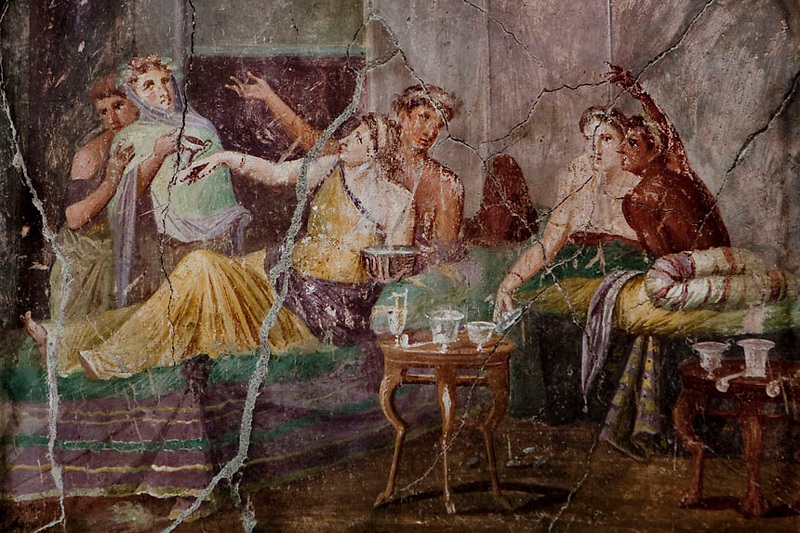 Roman fresco with banquet scene inside the House of Chaste Lovers in Pompeii.Nearly 4 month after the collapse of the House of the Gladiators and then of a wall at the House of the Moralist, Pompeii still faces neglet and mismanagement.Now the Italian government has begun to investigate the matter. Nine people are to be questioned, although Marcello Fiori, the emergency commissioner who was appointed to save the site in 2008, is conspicuously absent from the group.Those who will be grilled by the public prosecutor include the former superintendent of Naples and Pompeii, the site director who oversaw the waterproofing of the House of the Gladiators, the head of technical services at Pompeii, and an architect. The investigation will also examine Fiori's administration, which ended in July, including its use of government funds, which many critics have seen as wasteful and ineffective.